Mabel Keaton Staupers, R.N., was instrumental in ending the United States Army’s policy of excluding African American nurses from its ranks in World War II. In 1948 Staupers also successfully lobbied for full integration of the American Nurses Association. Mabel Keaton Staupers (née Doyle) was born in Barbados, West Indies on February 27, 1890 to Thomas Clarence Doyle and his wife, Pauline. In 1903 Doyle and her mother immigrated to New York City, New York, and Thomas Doyle joined them there a few years later. After gaining U.S. Citizenship in 1917, Doyle received her R.N. diploma from the Freedmen’s Hospital School of Nursing in Washington, D.C. In 1917 Doyle married James Max Keaton, a marriage that ended in divorce. Now called Mabel Keaton, she was committed to improving the health of impoverished blacks, so she spearheaded organizations dedicated to that goal. While working as a private-duty nurse in Washington, D.C. and in New York, Keaton organized the inpatient clinic for African Americans with tuberculosis at the Booker T. Washington Sanatorium, where she served as the Sanatorium’s first superintendent from 1920 to 1922. This clinic was one of very few facilities in New York that allowed black physicians to treat their patients. In 1931 Staupers married Fritz C. Staupers, a marriage that lasted until his death in 1949. Staupers served as the executive secretary for the Harlem Tuberculosis Committee from 1922 to 1934. Continuing her mission of health promotion, in 1934 Staupers became the first Executive director of the National Association of Colored Graduate Nurses (NAGN), where she served until she became the organization’s president in 1949. Staupers had been a member of the organization since 1916, while she was still attending nursing school. Staupers initiated a campaign to influence the U.S. Army to eradicate its discriminatory policy that banned black nurses from entering its ranks. Initially, the Army maintained a strict quota allowing only 56 black nurses to enter the service and enforcing segregated practices for those who were already in the service. Staupers protested the Army’s policy. When she learned that President Franklin D. Roosevelt planned to sponsor legislation early in World War II that would allow the Army to draft white women as nurses to meet the shortage instead of employing hundreds of black nurses readily waiting for the opportunity to serve, Staupers mobilized large protest efforts to rally support, and those demonstrations included both black and white nursing groups. In 1944 Staupers met with First Lady Eleanor Roosevelt to describe the dire circumstances black nurses were facing. On January 10, 1945 the U.S. Army opened its Armed Forces Nurse Corps to all applicants regardless of race. Staupers documented her long struggle in No Time for Prejudice: A Story of the Integration of Negroes in Nursing in the United States. 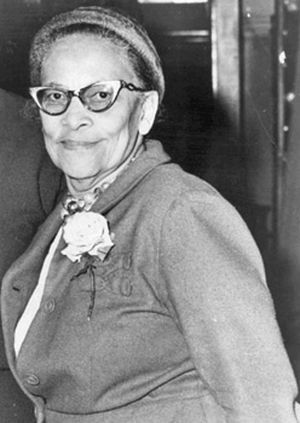 For her fight against discrimination, Staupers was awarded the Spingarn Medal by the National Association for the Advancement of Colored People (NAACP) in 1951. On November 29, 1989 Mabel Keaton Staupers died of pneumonia at her home in Washington, D.C. She was 99 years old. Andrew Salinas, "Mabel Keaton Staupers Papers, 1930-1977, Amistad Research Center, http://www.amistadresearchcenter.org/archon/?p=collections/findingaid&id=273&q=&rootcontentid=99685; Mabel Keaton Staupers (1890-1989) 1996 Inductee, American Nurses Association, http://www.nursingworld.org/MabelKeatonStaupers.